The Best Stain for the Job! There are so many deck stain choices available today that it's become impossible for professionals (let alone home owners) to determine which stain provides the best performance for the money. To make matters worse, many respected companies who have traditionally made great products have recently "tweaked" their formulations (i.e. reduced the amount and quality of resins and pigments) to achieve the supply price points required to sell through the big box stores and huge home-hardware chains. 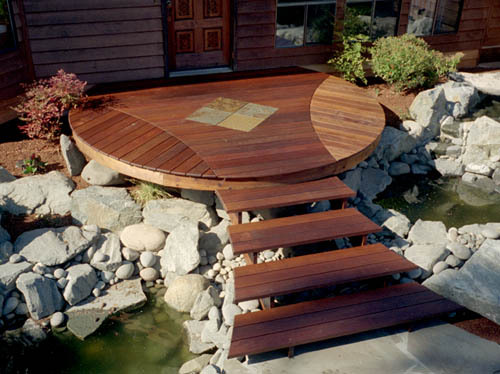 The Beautiful Deck Company conducted its own product research to find the very best value stain available. The results were quite conclusive - a modest company called Messmers from the harsh ski climate of the western US supplies a line of stains that have stood the test of time. They have resisted the temptation of selling through the big box stores and as a result the terrific quality of their formulation has remained intact. This is a very high-quality penetrating stain (never use a film-forming sealant on Ipe) that is formulated especially for Ipe and other hardwood decks. It is also one of the few hardwood stains that can stand up well to extreme temperature changes. Messmer's Caribbean Extreme Teak Oil Finish protects and conditions Teak, Mahogany or ay other exotic wood with the triple protection of three UV absorbers and stabilizers. Developed during a hobby project by the founder of Messmer's to formulate the absolute ultimate in a hardwood finish, it outperforms competitor's teak oils and often offers a cost savings as well. Messmers UV Plus Original is formulated specially for cedar, pine, redwood, and other softwoods. It penetrates deep into the wood and has extremely high quality solids (resins & pigment particles) that provide unmatched protection and beauty. Specially Formulated to penetrate and bond to chemically-treated wood fibres. Can reduce health risks to children and adults by reducing the harmful leaching of arsenic, chromate and copper from CCA treated lumber. Messmer's Composite Deck Finish is specifically formulated to add rich color and enhanced protection to old and weathered composite decking. Very high levels of UV absorbers, fungicides, resins and pigments return beauty and owner pride to composite decks in need of a fresh facelift.